Looking for the best cover for your Carolina Skiff JV 17 CC? We’ve got it. Ronald A. of Southport, NC shared photos of our cover on his boat. Thank you! Ronald opted for the 8 oz. Performance Poly-Guard in beige. This snug styled-to-fit cover is made by Carver Industries in the USA. It features shock cord in the hem, an attached motor cover that protects the outboard, and a tie down kit for trailering or storage. Each tie down strap goes through a loop in the cover and down around the trailer, buckles, and cinches down tightly. 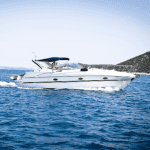 Carver designs each boat cover to fit the standard features of boats. In this case, the cover is designed to give adequate room to go up and over the center console, including the rail. The motor cover provides a nice, snug fit around the outboard. This cover also accommodates the bow mounted trolling motor. 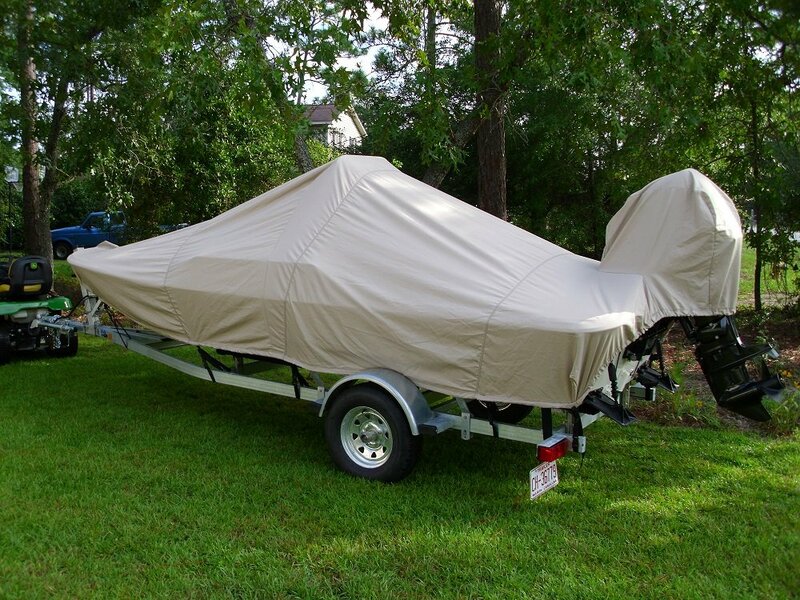 If you have a Carolina Skiff then start by browsing Carver boat covers for your Carolina Skiff model. For all other boats the easiest method is to start with our Carver boat covers application guide to search by make, model and year. If the previous steps didn’t show your specific boat, and you have the same style, then check boat covers for Center Console Bay Style Fishing Boats with Shallow Draft and Narrow Hulls. We should mention Carver bimini tops for Carolina Skiff are available, along with replacement bimini canvas in case you already have a bimini frame with a faded or torn top. If you’d like assistance then call or chat with us. We’re happy to help you. Plus, mention this blog post and ask for an additional 10% off your already discounted cover. Next: Which boat covers should I buy?